Collage Meet Up. Stay after program to work on your own collages. Open till 3pm. Bring your supplies. A collage (from the French word coller, to glue) is a work of formal art made by gluing different pieces of paper, photographs, fabric and other ephemera onto a supporting surface, thus creating a new whole. 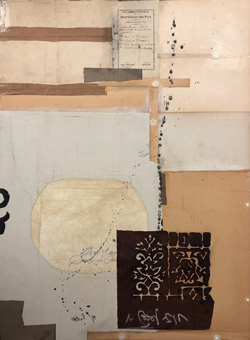 The term collage was coined by both Georges Braque and Pablo Picasso in the beginning of the 20th century when collage became a distinctive part of modern art. The Northwest Collage Society held its first regional meeting in 1984 as the North Coast Collage Society. In 1997 it became the Northwest Collage Society. The NWCS is affiliated with the National Collage Society, Inc., a non-profit organization headquartered in Hudson, OH with Gail Larson, NCS as regional representative. 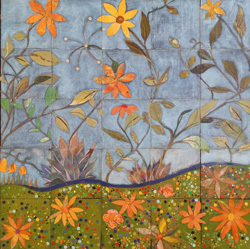 The purpose of NWCS, as adopted from the National Collage Society’s Articles of Incorporation, is “to foster the appreciation and interest in the recognized medium of collage.” The NWCS works to advance the stature of collage as a major art medium and assist in the education of its members and the public through exhibits, workshops, lectures and publications. The Northwest Collage Society meets in Seattle at the Richmond Masonic Center, 753 N 185th Street, Shoreline, five times a year, September through June. Meetings offer a variety of programs including guest speakers, demonstrations and slide presentations. Dues are payable the first of September, annually. The organization draws most of its members from Washington, Oregon, Idaho, Alaska and British Columbia. They come from diverse backgrounds: painting, printmaking, graphics, glass, sculpture, fiber and mixed media; all share an avid interest in creating. Members are kept informed through a bimonthly newsletter that includes information on workshops, opportunities to enter juried shows, details of upcoming programs and recognition of members’ accomplishments. 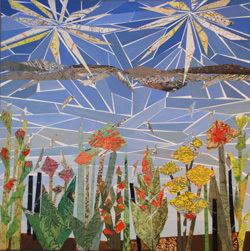 The Northwest Collage Society arranges two or more juried exhibitions a year for its members. Juried exhibitions are held primarily in the greater Seattle area as well as throughout the state of Washington. The Northwest Collage Society has exhibited at Cascadia Art Museum in Edmonds, Columbia City Gallery in Seattle, Bellevue Arts Museum Community Education Gallery, Phinney Center Gallery in Seattle, ArtsNow in Edmonds, Cancer Lifeline in Seattle, Parklane Gallery in Kirkland, Rob Schouten Gallery on Whidbey Island, Seattle City Hall, Kenmore City Hall, Mercer Island Community & Event Center, Washington State Convention Center and many more. Local members may also join the National Collage Society, which entitles them to an entry into the National Show and a Postcard entry in the annual National Postcard Show. Signature membership in the National Collage Society is attained after acceptance in three of the national exhibitions and is indicated by the initials NCS after the member’s name.